Espaçoso apartamento t1 com capacidade até 3 pessoas (2 adultos e 1crianças). Amplo terraço com barbecue ideal para refeições ao ar livre. Ar condicionado instalado tanto no quarto como na Sala. Cozinha totalmente equipada incluindo maquina de lavar loiça. Quarto com bastante arrumação e cama queen size. Sala equipada com 2 confortaveis sofas, sendo que 1 deles é sofa cama. Supermercado de grandes dimensões a poucos minutos de distância assim como pronto-a-comer, cafés e restaurantes. Acesso muito facil tanto pela nacional 125 ou pela Via do Infante assim como estações centrais de transportes públicos. Várias praias acessíveis a cerca de 20 minutos. Internet e tv por cabo disponiveis. Apartamento muito tranquilo. Com um propietario muito responssavel , muito bom. Apartamento óptimo para férias. Zona calma muito boa, 10 minutos do cais para a ilha de Tavira. A proprietária muito simpática , recomendo vivamente. We had a lovely time in this apartment. It was about a 10 minute walk to the centre of Tavira which is reflected in the economical nightly rate. It was really comfortable to relax in and recharge our batteries. We're looking forward to visiting again in warmer weather so that we'll get the opportunity to use the patio. Hosts couldn't have been more helpful. Hi Liz, thanks for your amazing review and for choosing us for your stay in Tavira. We look forward to welcome you once again in the future. Cheers! We had a wonderful two weeks in Tavira staying in Joao’s apartment. 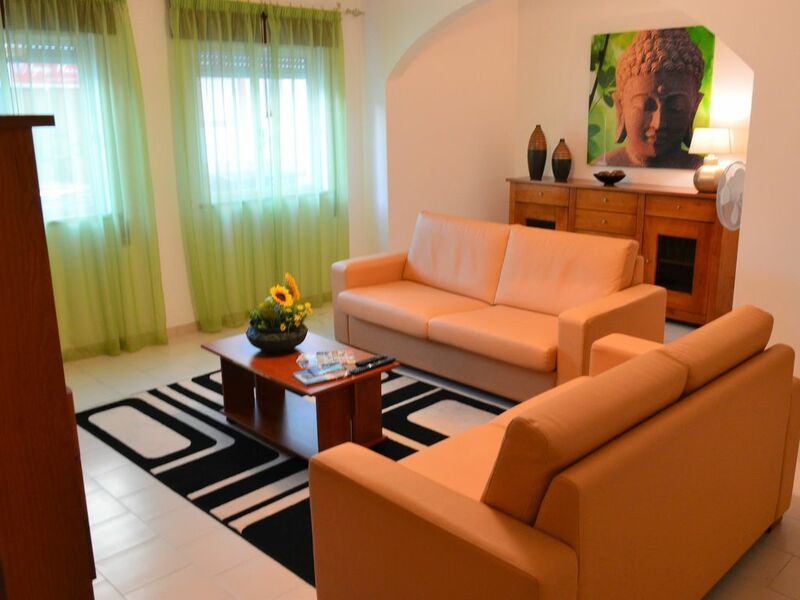 It’s really well positioned for access from Faro and just a short walk into the town centre The apartment itself is very spacious, comfortable and extremely well equipped and (thanks Leonora) spotlessly clean. We were greeted by Leonora and she generously presented us with locally produced figs and some monster tomatoes!! Both were absolutely delicious! When some friends joined us We used the BBQ on the outdoor terrace - though it’s not currently really suited to lying in the sun with shaded netting over most of it making it feel a bit humid. Thanks for the recommendations for local restaurants Joao - have to say we weren’t disappointed anywhere we chose to eat , Tavira is a gorgeous place full of friendly people and has a wonderful selection of restaurants - we were absolutely spoilt for choice and great value! We’d add to that list and recommend La Petit France on the other side of the river - the best meal we had , great service and atmosphere with live music. The beaches are wonderful in and around Tavira, but it is a bit of a trek involving ferries to get to them. Well worth it though when you get there. The healthy eating festival was on near the end of our stay and that just added to our overall good holiday experience. Finally I did some cycling while I was there (used Albilio bikes - they supplied very good road bikes and VFM). So we got out and about and met even more of the wonderful very kind Portuguese people. Tip thoough - take plenty water! Hey Steve, thanks for a delightful review. We are very pleased you've enjoyed Tavira and it's great to read such a lovely experience. We look forward to welcome you once again. We spent three great weeks at this flat and could not say enough about the hosts, Leonor and Joao! First, Joao kindly agreed to transfer us from the airport and back for a very reasonable price. Second, there were a couple of " hiccups" which they quickly addressed. The flat is very spacious, clean, and comfortable, and is within walking distance to stores, the waterfront, bus and train stations. We enjoyed our stay so much that, if possible, we will return next year! Thanks Leonor and Joao! A ocupação máxima do apartamento são 4 pessoas. Recomendamos a ocupação de 2 adultos e 2 crianças, visto que para dormida o apartamento tem apenas uma cama de casal e um sofá cama (que pode não ser confortável para adultos). Quaisquer reservas efectuadas para 4 adultos ou mais de 4 pessoas serão ponderadas e canceladas caso não haja mútuo acordo. Entre dia 15 de Julho e 2 de Setembro o aluguer efectua-se em múltiplos de 7 noites, normalmente com entradas ao Sábado, salvo acordo mútuo entre as partes. O check-in efectua-se a partir das 15:00 e o check-out até às 10:00. O proprietário reserva-se no direito de cancelar qualquer reserva caso não haja acordo em qualquer condição de arrendamento aqui mencionada ou complementar.